Have you thought about updating the look of your kitchen? Then let the professional craftsmen at Home Remedy go to work for you to give your tired looking kitchen a brand new look! Home Remedy provides top-quality kitchen remodeling services in the greater Houston area. We can freshen up the look of your old kitchen with new countertops, custom cabinetry and installation of new appliances. We can also add a sparkling touch of class with new flooring and paint. Our craftsmen are dedicated to customer satisfaction and will provide you with the highest quality Houston kitchen remodeling services. Licensed, experienced, and completely understanding of what it means to provide customers with the best service experience possible, Home Remedy consultants and contractors are a very solid choice for people interested in remodeling their kitchen. Custom cabinetry from the design stages through delivery and installation by our trained staff will draw gasps from you neighbors. The key with cabinetry is to look at your design options with a specialist before you order so that you can see a virtual picture of the kitchen that you have designed. If you decide that you like the layout of your kitchen, but would like there to be a new color scheme, using us to reface the cabinets or refinish them is another option. All of our cabinets are warrantied and area of top quality craftsmanship. If you are just getting started planning your cabinets, contact us by phone and we will arrange to sit down with you and find out what type of design will work best for your home when it comes to remodeling your kitchen. One of the most popular types of counter remodel is to put in an island. Islands are synonymous with increasing the entertainment value of your kitchen for both guests and your family. Cooking islands incorporate a grill into the island so that diners can be served immediately from the stove as they sit there and watch. If your stove or cooktop faces a lot of open space already, you can create the concept of a cooking island by leaving your cooktop where it is and adding extra space around it. Another popular counter upgrade is to add marble or granite as a surface material that replaces whatever you have. More durable and easy to cut on, granite in particular has captured the hearts of many Americans that would like a gourmet kitchen. Adding it to your counter configuration therefore increases the value of your home when you remodel. People also change out counters when it comes to bathroom remodeling. 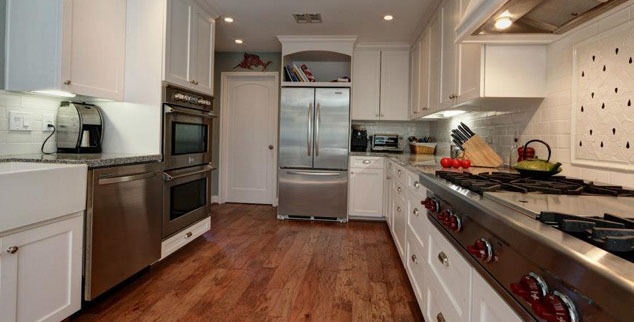 Flooring is one of the most personal choices when it comes to kitchen remodeling in Houston. We are therefore specialists at recommending and installing wood and laminate flooring- and carpet or tile. Each floor type requires a different type of implementation and we can show you what it will look like in advance of you actually purchasing it. One of the most frequent questions that we get regarding remodels is what type of flooring material will handle water damage the best. The answer is that although no floor is really designed to have water poured over it in volume, demand has caused most materials to be impervious enough that they will not be destroyed if their is a very large spill or temporary leak. By far one of the more enjoyable aspects of remodeling a kitchen in Houston for many of our clients is to choose a new refrigerator-freezer combination, a new stove, or new built-ins that extend the types of meals that they can cook with specialized equipment. It is for that reason that we are very flexible about the lines of appliances that we represent- and that we can install upon demand. As long as we are able to coordinate the construction schedule, we are able to work to incorporate almost any type of appliance into your kitchen remodel. So look at what we have to offer and look online at specific designs and functions that you would like to see in your new kitchen. When you are ready to start making decisions about your timeframe and your budget, give us a call! We can help put together a realistic estimate and plan for your Houston kitchen remodeling project quickly and well so you can remodel your home. To begin your home improvement project, call Home Remedy, LLC at 713-939-7717 today.